My words, my life.. my way!! 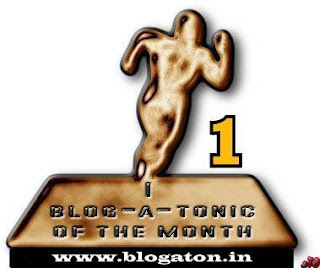 Overwhelmed to share this post won the Gold Batom at the October 2012 BAT 32! Riya was trying her new clothes when Ashish Bhaiya opened the door. "Oh! I am so sorry, I am sorry!" Ashish Bhaiya apologized and closed the door. She cursed her bad luck one more time and was thought aloud - "Why me again?" and hoped in vain that Ashish Bhaiya might have not seen anything. Within minutes she was downstairs with her family and Reena Auntie's family. She behaved as if nothing happened, but she could still feel the goose bumps. Ashish Bhaiya behaved as if he had not even met Riya till now. Later, both the families had dinner and Reena Auntie and Riya’s mom continued to talk till they called it a night. The day passed and Riya returned home with her family, she was in a fix and was trying to decide if she should tell her mother about this embarrassing incident. The answer was NO because, her mom would have scolded her for not bolting the door properly. She dropped the idea of sharing this incident. Riya didn't write her daily diary that day. It was Sunday afternoon and both the sisters were too engrossed in discussing their lives since they were meeting after a month. Like always Riya didn't want to come to Reena Auntie’s house but had to accompany her mom, she was not willing to leave her comfortable couch next to the television when unfortunately, Reena Auntie asked her to get the newly bought pressure cooker from the kitchen to show it to Riya’s mom. As Riya crossed the lobby, she noticed Ashish Bhaiya was studying in his room. She was making an attempt in reaching out for the top most shelf, when Ashish Bhaiya entered the kitchen and stretched his arm and helped her fetch the new Pressure Cooker. Riya got a little uncomfortable with the abrupt closeness they shared for that moment, while Ashish Bhaiya's body rubbed hers and his pelvic area touched her back. She changed her posture as soon as she could. It was the very next moment when Riya was stepping towards the door when she felt Ashish Bhaiya's hand on her waist. He pulled Riya towards the kitchen slab and picked up an Almond from the bowl kept on the slab. Riya was clueless about what was going to happen today! She tried to open her mouth to say, I want to go. But all she could utter was.. "Aaai" when her wide open mouth was sealed with Ahish Bhaiya's lips. She tried to resist and felt that he was too powerful for her. Before she could say anything, now he picked up an almond and planted it on Riya's lips and started biting both her lips and the almond. Ashish Bhaiya's hands were exploring Riya's body. Riya was too zapped and helpless to even shout or make any noise. When she gasped for a breath she pushed Ashish Bhaiya, hurried towards the door and left from the kitchen. She could hardly say anything when her mom questioned her about being so callous and not bringing the pressure cooker. On the way back home, Riya yet again dropped the idea of speaking about what happened today thinking her mom would judge her and probably not allow her to go out of the house to play with her friends. Riya didn't write diary that night. "Riya get ready, we are going for lunch to Reena Massi ji's house", screamed Riya's mom. Riya just couldn't muster up the courage to tell her mom why she hated going to Reena Massi's house. Unwillingly, she got ready and they drove to Reena Auntie’s house. “Hello Pinky! Hello Riya!” welcomed Reena Auntie. Riya greeted and met everyone in the family except for Ashish Bhaiya. He was not in the living area, so Riya was too relieved and comfortable to be at Reena Auntie’s house only until her mom interrogated, "Where is Ashish? Is he not at home"? To which Reena Auntie replied, "Pinky, he is upstairs preparing for his exams." Riya was disappointed with her mother’s interrogation. It was very difficult for Riya to kill time now. She asked Reena Auntie, "When are we having lunch I am hungry"? And she regretted initiating this conversation the very next minute! Reena Auntie replied, "Within 10 minutes, why don't you go and tell Ashish to come downstairs for lunch". Riya wanted to simply answer back and say- "NO, I will not go!" but all she could say was, "I want to watch this movie." It was not a substantial excuse and her mom immediately yelled at her, "Riya stop being such a TV addict"! Go right away! Like a school child Riya, counted the steps on her way upstairs. When she entered Ashish Bhaiya's room, she found him studying. She was so desperate to just pass the message and leave the room in seconds. But Ashish Bhaiya was too overjoyed to see her and he exclaimed, "When did you guys come"? Riya didn't want to talk to him, but she had to reply, "An hour ago, I think". He asked her to sit and she didn't sit. Riya signposted him why she was there in his room and conveyed the message, "Reena Massi asked me to tell you that lunch is ready." Okay we will have lunch together, at least sit down, he answered. "Are you not going to give me a hug"? In few moments he pushed her against the wall and started crushing her body. She tried escaping his powerful grip, but he bolted the door this time. Riya, realized if she will revolt he can get nastier. Ashish removed his pants and tried to show his manhood to Riya. Her eyes were closed. He offered her to feel him and make him feel good. Riya could have never imagined things would come so far and while she was just thinking how to make an excuse she was shocked to feel his hands on her skirt. He slid her clothes down and watched her with hungry eyes. Riya didn't make an eye contact and absolutely wanted to run away. He touched her and felt that she was too young and he uttered, "Oh! you are just 13"! Riya thanked God when Reena auntie shouted, "Ashi the lunch is ready, hurry up"! I want to tell you something, it is very bad and it is about me. I am very scared. I am very hurt and I want to die. But mom will scold me so I cannot die. I cannot explain it to you today, but one day I will tell you, "An untold story". Please keep it as a secret with you. You have been my strength! Your words mean a lot to me.. :) Love you XOXO! Sadly enough this fiction is so close to reality. Beautifully portrayed the vulnerability of many girls like Riya.. Thanks take care dear ! That was very heart touching, even though its only your imagination,its a reality everywhere.Admire your effort to put forward such an evil practice into your story. All the best for BAT.The title holds good for the story. Thank you so much Arjun :) for your wishes. I wish you all the best for the contest too :) ..
Goosebumps. Made me feel so sad for Riya. I hope wish and pray that no kids should have to bear this. Well written, the story crept into my mind :( And now I don't want it to stay there! Best wishes for BAT! I pray the same Deepa :) I am glad as a story-teller it could make a place in your mind for a while.. I don't know how close this is to reality, but the overwhelming comments make me think that it might be. As I can't connect with the story, I'll comment from a different angle. I like the narrative style quite a bit. It's fast and does justice to the plot. And 'she SIGNPOSTED him' - wow, never read such a usage of the word. :) It is a hidden secret in almost every girl's life Unknownshri. Thanks for your compliment! Thank you so much Megha for appreciating my post.. When I first read your post I was speechless.. and was so astonished.. cause I have seen such things happening.. and as everyone said it is damn close to reality... beautifully portraited..
All the very best for BAT..
:) Thank you for your wishes Ayushi..and I will keep in touch! That was indeed a very poignant narrative. Is is even more disturbing for any individual who has been there to endure..
Splendid narration . The scenes unfolded in my mind like a movie as I read along . Thanks Jaish :) m glad my narration could evoke visualization. Sadly, it is not Fiction but Reality!! Hope so many Riyas around will have courage to tell such stories and their parents would be sensitive enough!! I wish there is more awareness and friendly counselling for the kids. By the time we become teenager, these instances are a history! Your wish is my command, thanks for the feedback :) Done. Hey thats a very excellent potrayal of the issue. Amazing. Extremely well narrated and brings out the pain that Riya goes through.. A reality now a days that happens day in and out. Very sad. Thank you Rohan for reading and appreciating my work. :) Thanks. As I said there many Riya's living in this world with many many untold stories. Good luck to you! Thank a lot Kappu :) ..
Ayushi...*Hugs* .. you know it is may be because of the story you wrote.. :) I immediately clicked.. sorry if I sound a little biased :) .. But that's how it is as a reader :)..
Congrats for winning BAT. It was such a touching story and the narration was excellent. A gripping depiction of a sad reality. Where did it go :-(? I typed a long good one and its gone. Anyways i'm glad i found this blog and the story was just VERY good ! Thanks for visiting :) ..and dropping by, it must have been a technical glitch. Glad you liked it. Candid and talkative by nature, I come here to pen down what I feel and what is on my mind, in words and images. All Content Copyrighted, 2009-2015.. Picture Window theme. Theme images by tjasam. Powered by Blogger.